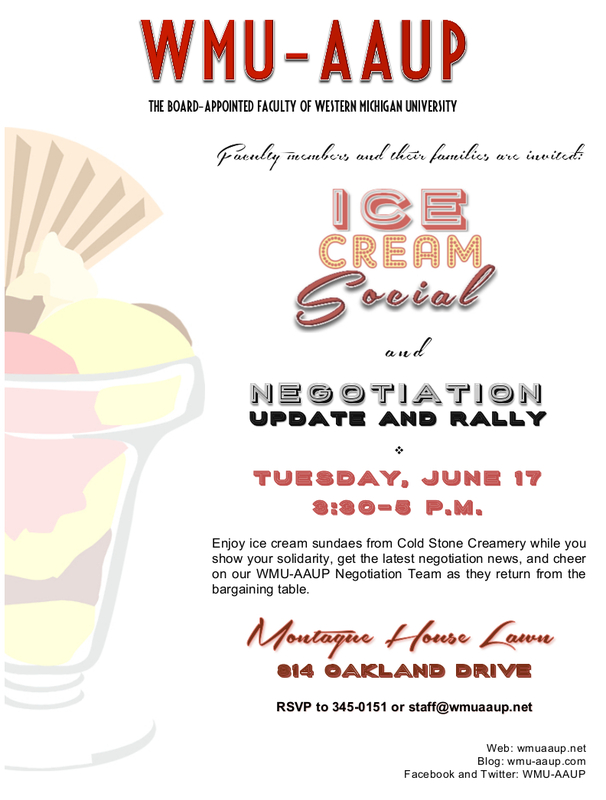 The WMU-AAUP will host an ice cream social and negotiation update and rally on Tuesday, June 17, at Montague House, from 3:30 to 5 p.m. Enjoy ice cream sundaes from Cold Stone Creamery while you show your solidarity, get the latest negotiation news, and cheer on our WMU-AAUP Negotiation Team as they return from the bargaining table. Bargaining-unit members, their families, faculty retirees, WMU students and alumni, and all other WMU-AAUP allies are invited. This entry was posted in Calls to Action, Campus Events, Negotiations, News and Updates by lcm. Bookmark the permalink.